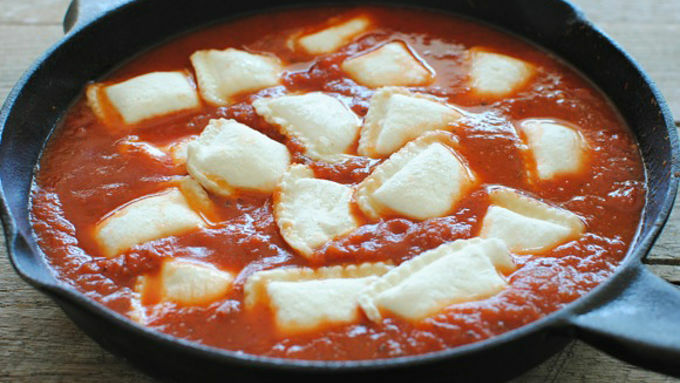 Add marinara sauce and 1/3 cup water to a 10-inch skillet and bring to a boil. Add the frozen ravioli and simmer, covered, over medium heat for 3 minutes. 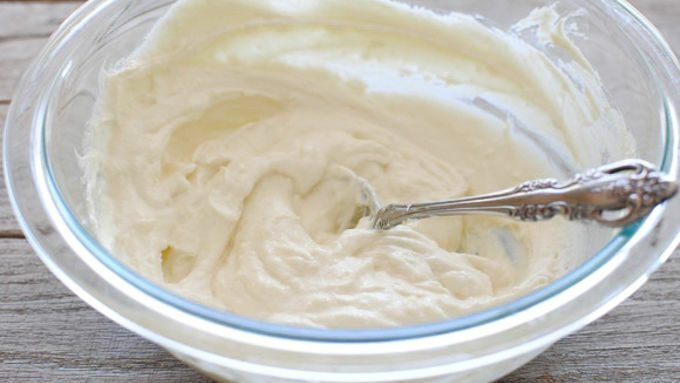 Meanwhile, combine the ricotta, egg and half of the Parmesan cheese in a medium bowl. Add a pinch of salt and pepper. 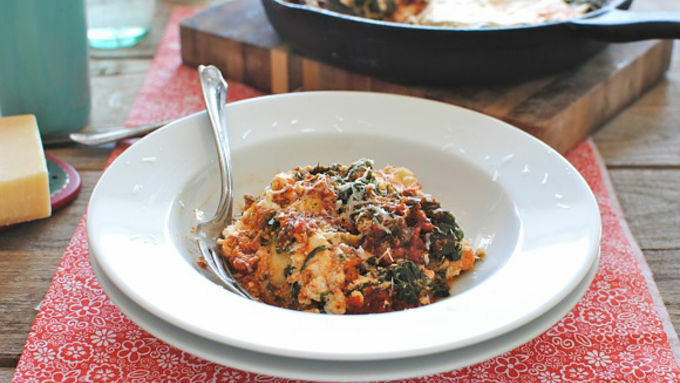 Arrange thawed spinach on top of the ravioli, and evenly spread the ricotta mixture in a layer on top of the spinach. Reduce heat to low, cover and simmer 10 more minutes. Serve garnished with the rest of the Parmesan cheese. 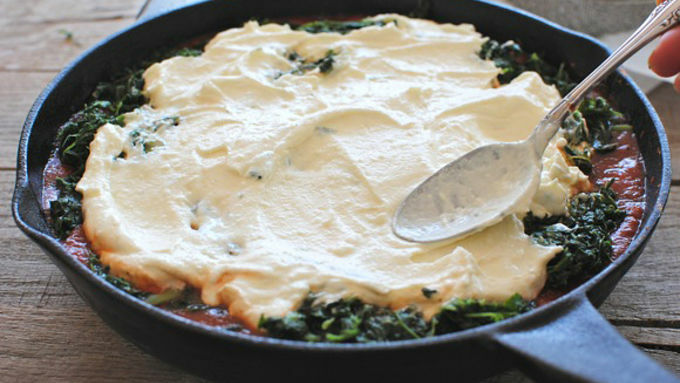 Your cast iron skillet is about to do the ravioli lasagna dance! Hi! How are ya? I'm fine, thanks! 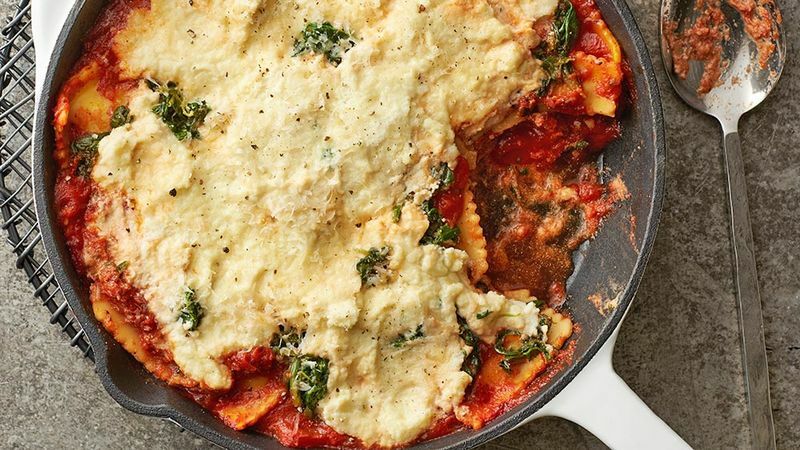 Just really, really, really jazzed to talk about this ravioli skillet lasagna mess. Can we just jump right to it or did you have anything else you wanted to talk about? Oh, people don't say jazzed anymore? Oh. Noted. Okay so this is one of those recipes that tastes like a LOT of work into it, when really all you did was simmer, layer, simmer, and watch Rachel and Ross fall apart because clearly they WERE ON A BREAK. It comes together in about 30 and your work is seriously nil to the nil. Let's make it! Grab some frozen ravioli. I used beef this time but you can totally use the cheese. Serve it up, Lou! (Who's Lou?) Ohhh my gerdness, it's stinkin' good. Everything just marries up and has flavor babies and it's UGH, ridiculous. Seriously, so no says jazzed anymore, huh?